The following information is extracted from ‘The History and Antiquities of the Diocese of Ossory’ Vol II by The Rev. William Carrigan C.C. in 1905. This appears to be the most recent record of Cullohill Castle. Some deterioration of the structure has taken place over the last century so the records may not accurately reflect the current structure. Cullohill Castle, the principal stronghold and residence of the Mac Gillapatricks of Upper Ossory is a massive keep built on solid rock. It occupies the south west angle of a partially circular courtyard, 50 perches in area (a perch is equivalent to just over 5m) and surrounded by a wall thick, strong and loop-holed (narrow openings for archers to launch arrows through). It stands nearly north to south and is about 90 feet in greatest height and is built of limestone and grouting. The south wall, most of the east wall and about half of the west wall remain to full height. The north wall in which is a ruined entrance door, and the other parts of the east and west walls are gone almost to first storey. At the base, the castle measures, externally 48ft x 41ft and internally 25ft x 18ft, which gives the walls and immense thickness of 11 ½ feet. In the second storey the walls are 9ft thick. There were 5 storeys in the castle. Originally the second and third storeys had each narrow loop or lancet windows in the centre of the south wall, but these were subsequently replaced by square cut stone windows, divided by single upright mullions and ornated label mouldings. Altogether there still remain 6 loops in the west wall, seven loops and four windows in the south wall and 8 loops in the west wall. Scarcely any of the loops are more than 4 or 5 inches wide. There was no spiral stairway, but very narrow flights of stone stairs in the thickness of the east wall which gave admission to the different storeys. Some of the stairs are now destroyed. 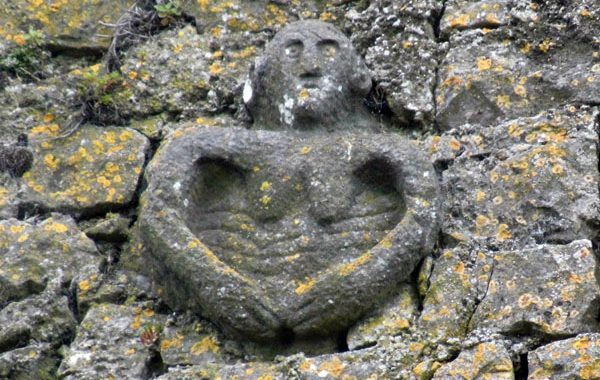 On the south end of the east wall, outside at a height of 40ft, there is a rude carving, in relief, of the head, breast and arms of a female, such is found in the walls of many of our castles, and to which people in some places give the name Sheela whee Gow (Sheela na Gig). For defensive purposes the castle was enclosed by a wall 8ft high. The castle draw-well is in the centre of the courtyard; it was filled up long ago with loose stones, which have been removed to a depth of 25ft but the bottom has not yet been reached. 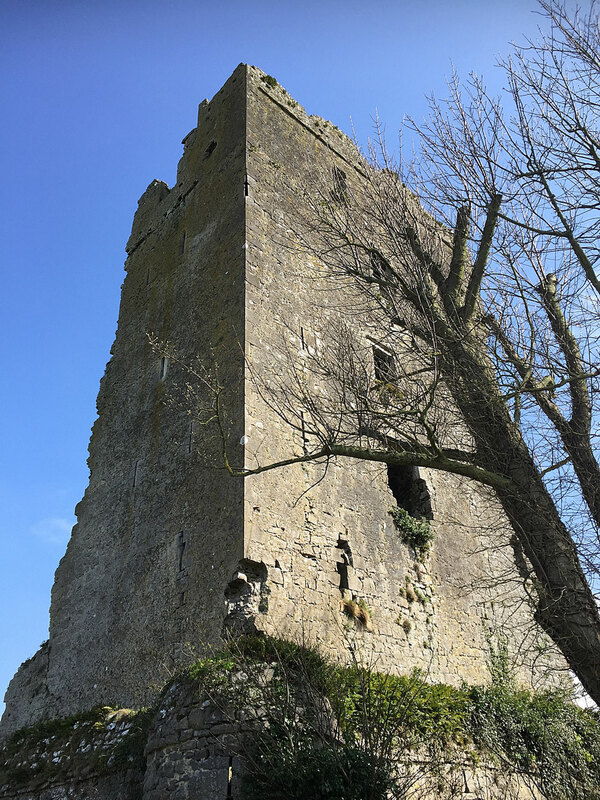 The date of erection of Cullohill Castle cannot be fixed with certainty but if it be assigned to the year 1425 there cannot be much of an error. 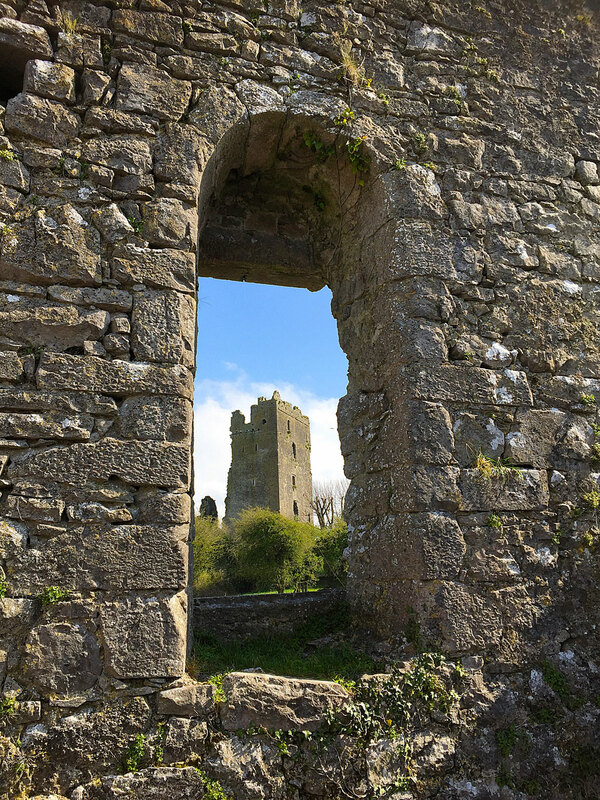 From its foundation to the middle of the 17th Century, when it is said to have been cannonaded and wrecked by the Cromwellians, its history is that of the Chiefs of the MacGillpatrick. It was for the ‘breaking’ of Cullohill Castle, the Sovereign and the citizens of Kilkenny received an award from King Henry VI in 1441. In 1517, it again came in for hard usage from the Kilkenny men, it’s Lord’s relentless foes, who, invading his territory in war-like array took the castle of ‘Coolkill of Ossory’ by force and bore away with them one of its principal gates that they might set it up as a trophy of the victory in the Kilkenny Tholsel of the time. According to the Down Survey Books, Cullohill Castle was ‘out of repaire’ that is ruinous and uninhabited by 1657. Information and photograph, from Laois Archeology. To read the full article, follow the link below!